I'm a minimalist at heart, carrying the least amount of gear needed to do the job, both at work and play. The only computing devices I own are a Macbook Air and a Blackberry Bold. When I travel, the Blackberry is my primary tool and the laptop becomes a vehicle for slide presentations. For the minimalist, is there a possibility of just traveling with a single mobile device? The Blackberry Presenter enables Powerpoints to be shown from the Blackberry on any video display or projector device. The idea is that the your Blackberry can wirelessly connect to the Presenter device and you can control any powerpoint slide presentation directly from the Blackberry via Bluetooth. 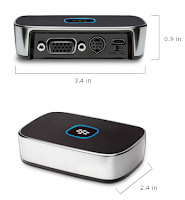 A 3.4 x 2.4 x 0.9 inches (86 x 60 x 23 mm) Bluetooth video interface for on the road presentation of Powerpoint from your Blackberry - that's cool! You can use the iPhone's "Remote" app as a remote to control a Keynote presentation on your MacBook Air... also very cool. Maybe BlackBerry has a similar app.